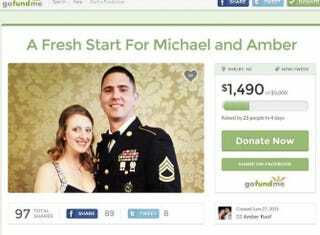 Amber Roof, the sister of accused Emanuel African Methodist Episcopal Church shooter Dylann Roof, created a GoFundMe page asking for help financing her wedding and honeymoon, hoping to raise some $5,000, the Post and Courier reports. The page, which the news site notes has since been removed, had raised almost $1,500 of the $5,000 goal before it was taken down. Amber Roof was hoping to raise the funds to "cover lost wedding costs, to pay bills and to send [her and her fiance] on our dream honeymoon." She also promised to donate 10 percent of the money to Emanuel AME Church, the Charleston, S.C., church where her brother is accused of opening fire last month, killing nine people. Amber Roof and her fiance were supposed to have been married on June 21, four days after her brother's alleged shooting spree. "It was suppose [sic] to start our lives together with our new family. Our day was the exact opposite. Our wedding day was full of sorrow, pain, and shame, tainted by the actions of one man," she wrote on the GoFundMe page, according to the Post and Courier. "The Charleston Massacre took place and our lives were forever changed. The media abused our privacy and published all of our wedding information and destroyed our dream day. Destroying the first day of Michael and my life together." In the aftermath of the tragedy, Roof and her fiance ultimately canceled the wedding, "to protect our family and mourn the lives of those lost," but now would like "the chance to start our lives on a postive [sic] note. "Therefore, we have decided to start a GoFundMe account. We know money cannot replace the wedding we lost and our perfect day, however it will help us to create new memories and a new start with our new family,” she added in the statement on the site. Needless to say, although some people decided to help out the couple, others were not very impressed by the campaign. "This has to be the most self-centered and insensitive fundraising page I've ever encountered and I'm shocked that gofundme hasn't erased you from their existence already!" one woman posted, according to the Post and Courier. "I can't imagine the anguish and sorrow that your own brother has inflicted on so many wonderful and kind people and all the while, you are fantasizing about letting others fund your honeymoon!!" As many of you know Michael and I had to abruptly cancel our wedding day, due to the tragedy that occurred in Charleston. June 21st was suppose to be the happiest day of our lives. It is the day every girl dreams of, it was the day we dreamed of. We had each other, we have the perfect venue, and we had our vows ready to be read. We were ready! We had planned out every detail for months and months. It was going to be the PERFECT day! Our wedding day was suppose to be the most important and special day of our lives. It was suppose to start our lives together with our new family. Our day was the exact opposite. Our wedding day was full of sorrow, pain, and shame, tainted by the actions of one man. The Charleston Massacre took place and our lives were forever changed. The media abused our privacy and published all of our wedding information and destroyed our dream day. Destroying the first day of Michael and my life together. We cancelled our wedding to protect our family and mourn the lives of those lost. Many friends and family members came into town and took time off of work to be there for us. We could not ask you to do that again. We would like the chance to start our lives on a postive note. Therefore, we have decided to start a Go Fund Me account. We know money cannot replace the wedding we lost and our perfect day, however it will help us to create new memories and a new start with our new family. Money raised will be used to cover lost wedding costs, to pay bills, and to send us on our dream honeymoon. 10% of all funds raised will be donated to Emanuel African Methodist Episcopal Church. We thank you for any contrabution [sic] you can make. Our lives have been forever changed and touched by all the love and support you have shown us through this difficult time. THANK YOU FROM THE BOTTOM OF OUR HEARTS! GOD BLESS! Read more at the Post and Courier and the Daily Kos.